Are you an intrepid explorer of the unknown? Do you enjoy having your mind twisted in ways you never thought possible? Are you ready to leap down the rabbit hole and emerge in undiscovered territory? Well then...The Convoluted Universe (Volumes 1-3) is your ticket! Dolores Cannon’s involvement in the field of hypnosis for over 40 years has resulted in many thought provoking books. She also lectures around the world and teaches her very special method of induction. Cannon began her career as a hypnotherapist, aiming to help her clients solve their problems through the process of hypnosis. It was during one of these early sessions that her amazing journey into the unknown began. While under hypnosis, her client suddenly transformed before her eyes – a totally different personality emerged with it’s own vocal patterns and body language. In the next series of sessions she regressed her client to 5 distinct lifetimes back to when she was created by God! Cannon’s life and belief system was changed forever. Fascinated, she now saw this work as a way to explore the history of our world and beyond - “firsthand”. In the late ‘70’s she discovered that the majority of problems people experience can be traced back to events that occurred in their past lives, instead of their present ones Over the years she has developed her own method of regression, and is able to quickly get her clients to the somnambulist trance state which is the deepest possible trance state. It is there that she is able to contact and communicate with the individual’s subconscious. Through her books, Cannon brings us along with her as she regresses her clients back to past lives and beyond. The narrative voice is engaging and down to earth. She shares her internal dialogue as she comes to terms with the strange situations and areas of the unknown her clients find themselves in. The most amazing thing to me, is the shocking similarity of information brought forth by these people from all over the world - all strangers to her and each other. That really got me thinking. Buried deep within our subconscious lies a wealth of experience and information. And the knowledge that we are all connected. Volume One of The Convoluted Universe transports you to the days of Atlantis, where you’ll learn about many Earth mysteries such as the lines of the Nazca Plains, Easter Island, the Pyramids, and so much more. You will explore parallel universes, group souls, other planets, alien life, other dimensions, and more. Most of all, when you come to the end of the book you will want more! Not to worry there are three volumes, with another on the way! Volume Two begins with insight into Cannon’s personal journey. You will stand beside her clients as they relate accounts of their past lives in places such as ancient Egypt, Atlantis, and hidden underground cities. You will hear about life on other planets, time portals, karma, star people, advanced beings, aborigines, creator beings, facets of the soul, raising of vibrations, frequencies, the New Earth, and things you could never have imagined! By now you should be brimming with questions and a longing to discover more. Just in time for Volume Three! and lots of information on the upcoming changes for the Human race There are more insights into previously unknown areas than I can mention here. I don’t want to give away any more of the book! 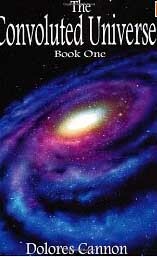 Read The Convoluted Universe and your vision of the world and reality will never be the same! I Like all work(books) by Dolores Cannon .